Many camping enthusiasts enjoy an occasional glass of wine or, they should! I wholeheartedly encourage wine consumption as a cocktail beverage, to complement a meal or for any special occasion. Wine consumed in the great out doors especially, will enhance the camping experience, add to the festivities, complement meals and stimulate recognition and appreciation of the picturesque surroundings (actually, enough alcohol related beverages of any type can make even the Wal-Mart lot more attractive). Wine has the capacity to stimulate the senses, relax the mind and body and can put a person in a more peaceful and tranquil frame of mind. This is an especially important following an 7 / 8 hour road trip under challenging circumstances and conditions and, after going through the riggers of setting up camp. Weather one enjoys the space age technology of an extravagant fifth wheel (with multiple slide-outs) or the aristocratic comfort of a vintage or new “Airstream”; enjoying a glass of wine can contribute to a more enjoyable and meaningful camping experience. The trick is to consume the wine at the optimum temperature for full appreciation and enjoyment. Everyone, I believe, is aware that white wine and rose should be served nicely chilled and red wine is best enjoyed at room temperature. However, a considerable amount of wines are consumed at temperatures not conducive to maximum enjoyment. White wines are commonly served (consumed) entirely too cold while red wines are normally too warm for a pleasurable experience. If wines are not consumed at proper temperatures, the subtle nuisances, delicate nature, layered complexities will be masked over and much of what is intended by the winemaker (in the flavor profile) will be lost. If white wines are too cold they will be refreshing but tasteless and, if they are too warm the alcohol will be unpleasantly persistent and the wines will be somewhat “flabby” and listless. If red wines are too warm they will be alcoholic and taste of vinegar and if they are too cold they will have an overly tannic bite and be lacking in flavor complexity. Generally my recommendation is that you take white wines out of the refrigerator 15 to 20 minutes before meals / consumption and let them warm up ever so slightly. I also suggest that you chill red wines for about 10 to 15 minutes before drinking. But, for more exacting temperatures refer to the table below that I have assembled for your information. Please keep in mind that depending on the grape variety or wine, the country of origin, the producer and his /her wine making philosophy, some of the above mentioned wine types can fall into different categories. This is a basic overview of the wines that most consumers will be familiar with. * A special not here – do not ever, under any circumstances, add ice to your glass of wine to chill it down to your taste (is my dear sister-in-law listening?). The ice will dilute the flavor and taste of the wine. It would be much more productive and rewarding to consume the wine at the optimum temperature. On the road in whatever “rig” fits your fancy, it isn’t always easy to control the temperature of your provisions. This is true with wines also. To assist you with the maximum enjoyment of your treasured wine selections, I have assembled few “tools” that will aid you with controlling the temperature of the wine to the point of consumption. With a relatively small and compact device, you can measure the temperature of your wine to insure that you are consuming each wine type at the proper temperature. See Wine Thermometer 9340 with a wood handle available at the Beverage Factory. Be sure to pursue the site for additional devises that may be of interest. 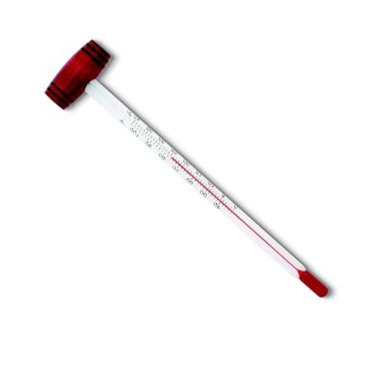 WINE THERMOMETER – 9340 with Wood Handle – shown below. . .
With the previous thermometer, the bottle has to be open before you can measure the temperature of the wine. But, this interesting contraption clips on the bottle and measures the temperature of the wine before opening the bottle. Airstream owners will be especially pleased to know that this interesting device is constructed of high-quality stainless steel. The marketing company of this thermometer offers a 100% satisfaction guarantee. 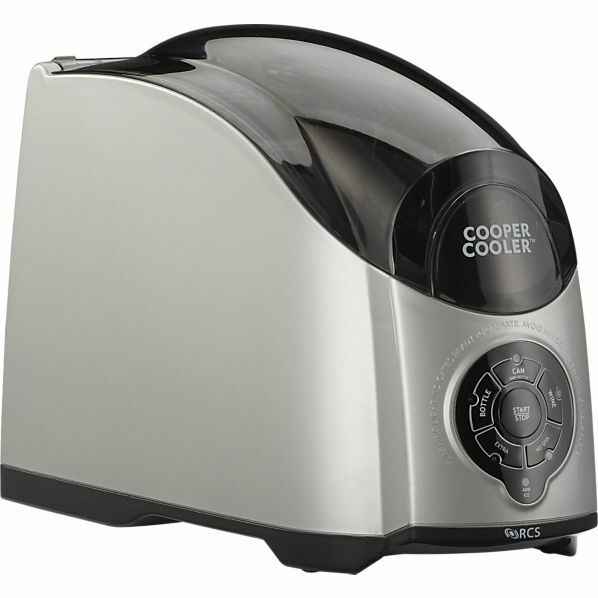 Go to Compact Appliance and VinoTemp for details and to order one of these fascinating devices. VTBOTTLETHERM – Vinotemp Wine Thermometer Bottle Clip – view below. . . This thermometer has similar features to the previous unit and will instantly alert you to your bottle’s temperature. It is also stainless steel and expands to fit most bottles. 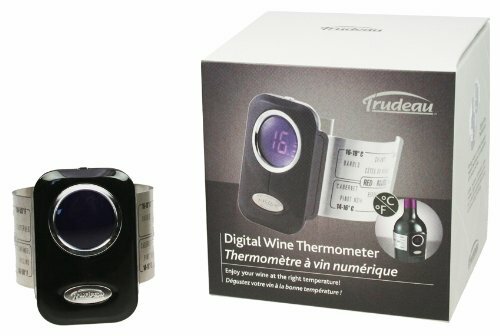 Visit Trudeau Digital Wine Thermometer for information and to place an order. TRUDEAU DIGITAL WINE THERMOMETER – pictured below. . . 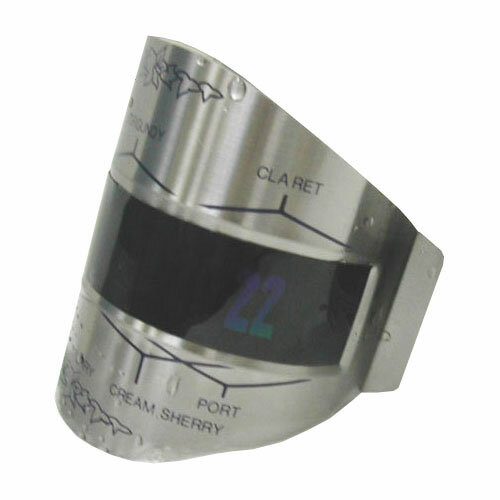 The above mentioned units will measure the temperature of your wine in order that you may consume each and every type at the optimum temperature. But with this “Rapid Chiller” you can take a bottle from storage and quickly chill each bottle to the desired and appropriate temperature. The sleek space age design would be appealing, attractive on the counter of any motor coach, travel trailer, fifth wheel, truck camper or pop up. The Rapid Chiller will go anywhere and function well, just as long as you have a power source. This chiller is featured and offered at Crate & Barrel. On this site there are a myriad of additional “wine oriented” tools for your interest and convenience. RAPID BEVERAGE CHILLER – see below. . .
Now that you are aware and will be consuming wines in the future at the optimum temperature, you will thoroughly enjoy each and every glass and bottle – whatever type or style of wine that strikes your fancy.